Size of Male: 17-23 lbs.,16-17 in. Size of Female: 17-23 lbs., 15-16 in. Looking like a little lamb, the Bedlington Terrier is a mild-mannered, gentle terrier. Although he shares similar origins as other terrier breeds – he was bred to kill rats and hunt other small game – the Bedlington is not as feisty or rambunctious as most of the other terriers. He makes an energetic playmate for children but he’s relatively calm. Bedlingtons make excellent family dogs. The Bedlington Terrier descends from a dog named “Old Flint,” whelped in 1782. The breed may have originally been kept by gypsies and poachers to hunt land owned by the gentry. The dogs came to the attention of Lord Rothbury in the town of Bedlington, according to one story. 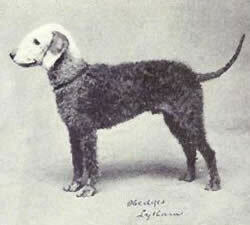 Later, the name was changed to the Bedlington Terrier after the Bedlington Mining Shire in Northumberland county, England, where the breed was further refined. In the 1800s the dogs were used for killing vermin and the miners raced the dogs. Bedlingtons are quite fast. Dandie Dinmonts, Kerry Blues, Soft-Coated Wheaten Terriers and Whippets may have all mingled to create the Bedlington breed, or shared ancestry with it. Compared to other terriers, the Bedlington variety is rather calm and mild-mannered. They are very loyal and loving toward their families and they are quite intelligent and gentle. These dogs love children but they can be very energetic playmates with them. There is nothing fussy or mischievous about this dog breed. They have a big heart and they are very lovable. However, they can be quite courageous when necessary. They are playful and affectionate and they are reasonably friendly with strangers. They can get along well with other dogs and pets, but it helps if they are well-socialized with them when they are young. Bedlingtons can be barking dogs. Living Environment – The Bedlington Terrier can make a very good apartment dog but they do require plenty of daily exercise since they are energetic dogs. They enjoy having their own fenced yard but beware: they are enthusiastic diggers. Grooming – Grooming for this dog breed is complicated. They have one of the more difficult coats to keep looking nice. They shed very little and they need to be professionally groomed every six to eight weeks by someone who knows what they’re doing. The body of their coat should NOT be clipped or the dog will not look like a Bedlington. Otherwise, brush your dog regularly but don’t bathe too frequently as this will make the coat too soft. Diet & Exercise – Dietary needs for this dog breed are considered normal. They do require plenty of daily exercise. It’s best not to allow these dogs to exercise off-leash since they can be prone to chase small animals and they may not return when you call. They enjoy having a small yard for play and exercise. Health – The major health problem for the Bedlington is copper toxicosis, which is an excess of copper in the liver. There is now a genetic test for this problem and it has mostly been bred out of dogs in the United States. If you are interested in this dog breed you should ask for proof of the dog’s status with regard to this disease. Kidney disease, progressive retinal atrophy, cataracts, thyroid problems, cataracts and retinal problems are also found in Bedlingtons, but these may only rarely occur. If you are interested in getting a Bedlington you should talk to a breeder about possible dog health problems in the breed. Bedlington Terriers are intelligent dogs and they are eager to please. This means dog training is usually easy, especially compared to some other terrier breeds. They can be taught obedience, agility and participate in other dog activities. As you might expect with such a gentle and affectionate breed, they do well with positive dog training methods (praise, rewards) and enjoy learning new things.